Quality and value are both equally important to business customers when shopping for professional web design. In the past, maximizing one has meant marginalizing the other. Dexign’s new collaborative web design services, called FastTrack®, take quality and affordability, together, to the next level. If you’re planning a website or considering new ideas for an existing site, find out how Dexign can create a new online image for you or reinvent an established one. If you have any questions, contact us today. Or if you’d like, set up a free information-only consultation with NO obligation. It’s a great way to discover the possibilities for marketing yourself on the web. Every project begins with in-depth dialog between customer and designer to pinpoint design traits, preferences and objectives. If you’re interested in any of our specialized design services, contact us today to learn more or to get started. Click below to use our easy Quick Contact form, visit our contact page, or call us at (541) 289-6352. A quality web presence has never been more important. Its role is essential to the effective local and regional (even global) marketing of your product or business over the internet, the one place where potential customers can get to know you on your terms, long before you ever meet them. In fact, long before you ever even know they exist. Introducing FastTrack collaborative design solutions. Welcome to the Internet: The one place potential customers can get to know you on your terms, long before you ever meet them. In fact, long before you ever even know they exist. FastTrack design services incorporate collaborative design content from some of the top designers in the industry and feature high-end quality and intuitive user interfaces The depth and quality is striking, all while offering a fast track to design completion. This results in unprecedented value by generating a finished site at a fraction of the time and price previously possible, while maintaining the highest standards and state of the art in design quality. Previously available only through expensive high-end custom design, FastTrack takes this level of quality and value direct to small business owners, in some cases, for the first time. This revolutionary new approach is accomplished through the strength and resources of a global network of top-tier web designers. This networked team is your key to a high-end site at a small business price. It has simply never been more affordable. In plain talk, FastTrack-designed sites are available for a fraction of the cost of other sites of similar quality produced by traditional methods. Furthermore, if these same sites were developed using traditional methods, rather than collaborative design, the cost would remain out of reach for many smaller businesses. At Dexign, quality and value converge with FastTrack. Certain clients require the flexibility, scope and exclusivity of custom design services that originate conceptually and visually from scratch. Although not as value-added as the flat rates found in our FastTrack collaborative design services, custom design is available at an hourly billable rate for design projects adapted to client specification, budget and timeline. For custom design pricing, contact us for fixed hourly rates and project quotes. All ‘Dexigned’ sites include standards-compliant design for faster and more efficient page rendering and accessibility. These standards will ensure that your site is fully optimized. But what exactly are web standards? The World Wide Web Consortium (W3C) has established technologies for creating and interpreting web-based content. Known collectively as web standards, they deliver the greatest amount of benefits to all users on the web. By using web standards, your site’s foundation is built on technologies that have been developed and tested by leading experts worldwide. With more than 500 companies and organizations contributing, these standards are truly the leading edge of the web. 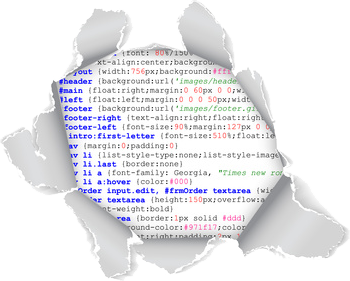 Our HTML/CSS-based design uses Cascading Style Sheets (CSS) to manage all presentation aspects, and standards-compliant HTML5 or legacy XHTML to handle all content. This results in a site that ensures long-term viability of your content on the web. 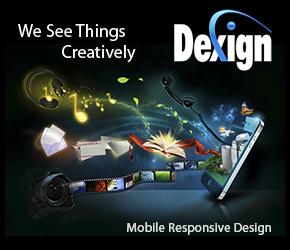 Standards-compliant authoring is available for all collaborative design services offered by Dexign. Content Management Systems (CMS) are becoming increasingly popular for small business owners on the web, eliminating the need to manage their content changes and updates from within the source code (HTML/CSS). In many cases, the complexity and tedium of code-level site maintenance is not an option for them. CMS sites save an immense amount of time, effort and training resources. For these reasons, Dexign recommends FastTrack CMS sites (including WordPress, Joomla! and MotoCMS) for clients with limited technical skills in maintaining their site using source code or wishing to incorporate a team of contributors. All FastTrack® collaborative design services offer the value and assurance of flat rate pricing. This means no unpleasant surprises or sticker shock along the way. Speaking of value, the entire FastTrack catalog packs quite a punch when it comes to dynamic, visually stunning websites at unprecedented prices.